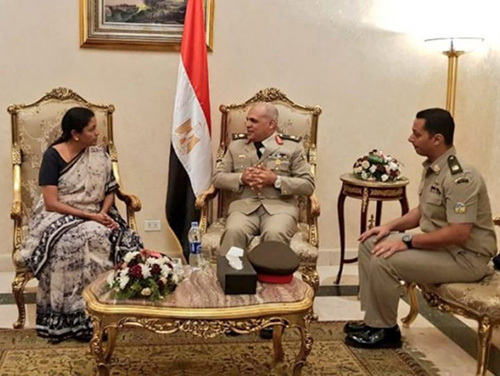 Indian Minister of Defense Nirmala Sitharaman met on Friday with Egyptian Minister of Defense Mohamed Zaki during her two-day visit to Cairo to enhance security cooperation between the two countries, according a tweet posted on the official twitter account of the Indian Ministry of Defense. The Minister was received by Major General Emad El-Ghazaly, Commander of the Central Region, Egyptian Army at Cairo International Airport. According to local media reports, during the meeting, the Ministers reviewed the outcomes of previous visits among officials from both countries. Egyptian Foreign Minister Sameh Shoukry had visited India in March this year to attend the 7th session of the Egyptian-Indian joint committee. Egypt and India are considering joint defense projects, with the exception of training programs for other defense personnel in key institutions, as there are already plans to begin joint exercises between the two countries, Times of Egypt reported. Egyptian-Indian relations have long historical established ties. They are among the oldest civilizations in the world, since ancient times. There have been numerous contacts between Egyptian and Indian leaders throughout history to strengthen cooperation, and strengthen partnership in several areas. Meanwhile, India will seek to strengthen its strategic partnership with the Sultanate of Oman when Defense Minister Bader bin Saood Al Busaidi visits Delhi this week. Measures including early operations of Duqm port for the Omani navy and training of Omani military officers in India, are among the topics to be discussed during this visit, The Economic Times reported. The visit will help further Oman’s nascent space program and expansion of bilateral military exercises, said officials, as Oman is putting in place its space agency.